Turning the page on The Gazpacho Diaries. The air has changed. After a light rain before dawn, today is muggy and a little cooler. The crackling dry heat of summer has passed. It’s the last day of August, the last day of my grand Month of Gazpacho. I still have a pitcher of gazpacho in the fridge. But, maybe, with the arrival of some clouds, I’m ready to move on. I’ve served gazpacho every single day for a month. In 31 days, I made 12 different batches of the stuff. I served it for lunch, for snacks, for tapas, on picnics and potlucks. To family, to guests, to kids. Here are some notes from my gazpacho chronicles. 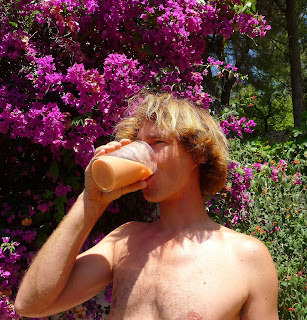 Gazpacho proves to be a potent antidote to heatstroke, as Ben found out when he overheated while clearing brush in the arroyo. Indeed, gazpacho was once the summer meal of threshers in the fields, providing nourishment (bread, olive oil and tomatoes), fluids, salt to prevent dehydration and vinegar to quench the thirst. Kids like gazpacho with chips. 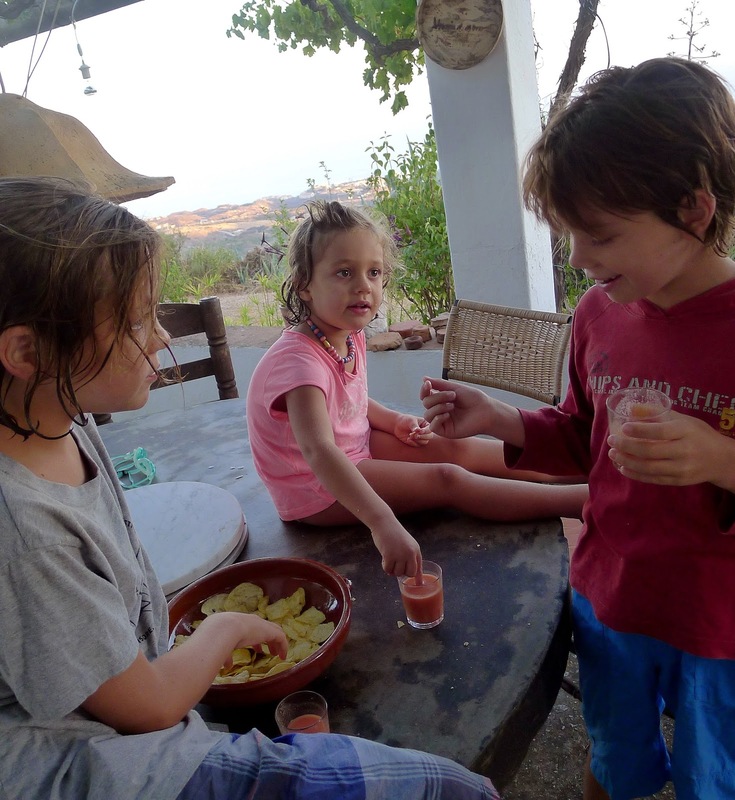 After a swim: gazpacho and chips, the perfect kid combo. From left, cousins Levi and Cloe Gordon and my grandson, Leo Searl. 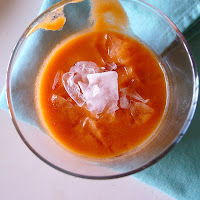 If you are packing gazpacho on a picnic or to a potluck, funnel it into a tall plastic water bottle for easy transport. Cool by the pool on a lazy summer’s day. 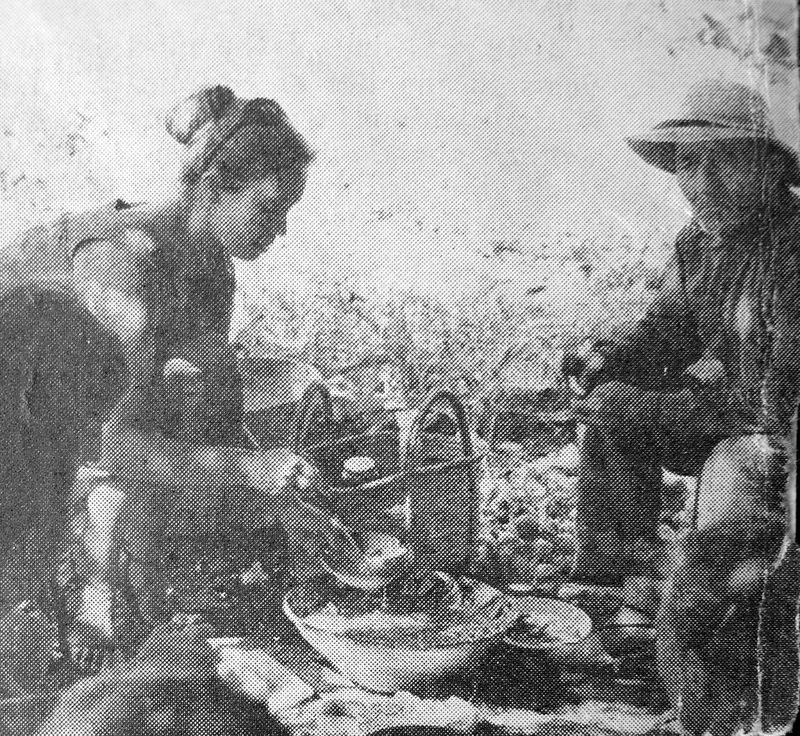 Guests George and Marja Parker sit in the shade of a leafy fig tree and sip gazpacho from goblets. George (http://www.georgeparker.tv/) is an illusionist who performs worldwide. 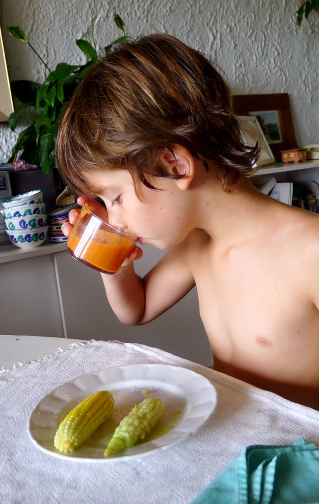 Lunch: Leo enjoys gazpacho with corn-on-the-cob. Why not? Gazpacho with marinated fresh anchovies. 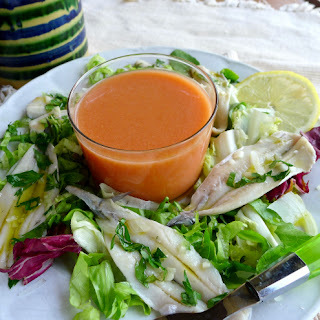 Marinated raw anchovies (boquerones al natural), salad and gazpacho make a lovely light lunch. What else does gazpacho go with? 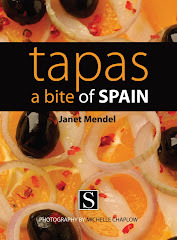 Serve it alongside fried fish or fried chicken, with just about anything from the grill, with sandwiches, with stuffed eggs or Spanish potato tortilla. 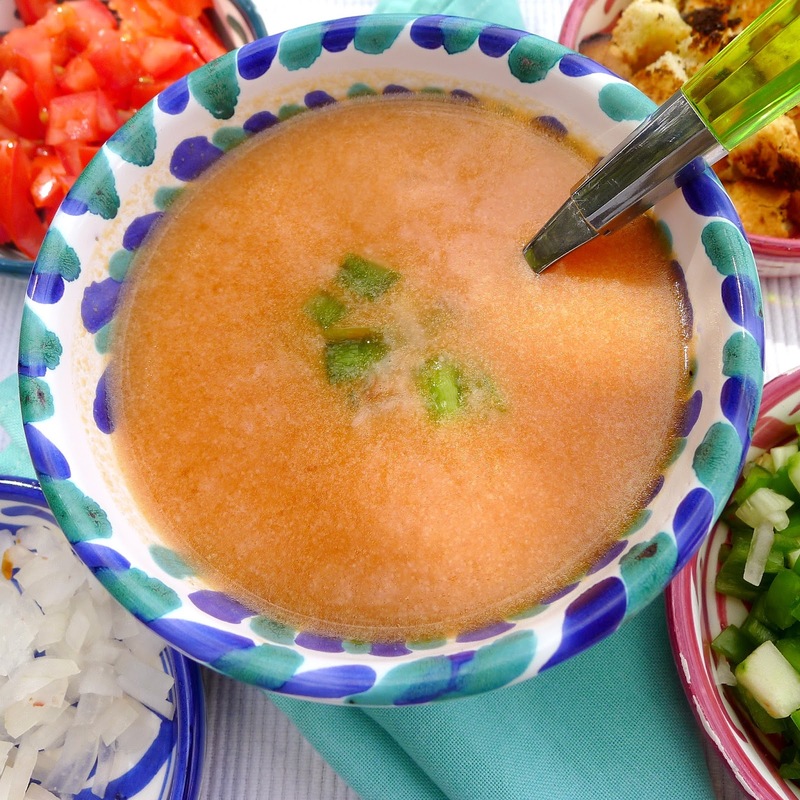 Don’t serve gazpacho for late-night dinners, say Spanish friends. “Se repite,” it “repeats,” meaning the garlic and oil come burping back up. Not a problem, as gazpacho is so perfect in the sunshine, that it never occurred to me to serve it after dark. At my house, we spooned gazpacho over grilled bread to serve with serrano ham, an Andalusian version of Catalan pan con tomate. I used leftover gazpacho as a dressing for salad of green beans, sliced potatoes and greens. Gazpacho makes an instant, no-cook pasta sauce. Let the gazpacho come to room temperature. Toss it with hot penne. Add some sliced mozzarella and basil leaves. Or, use it as a dressing for a cold pasta salad. In this month of gazpacho, I only regret that my own tomato garden has not met the daily challenge. I have had to buy tomatoes to keep up. 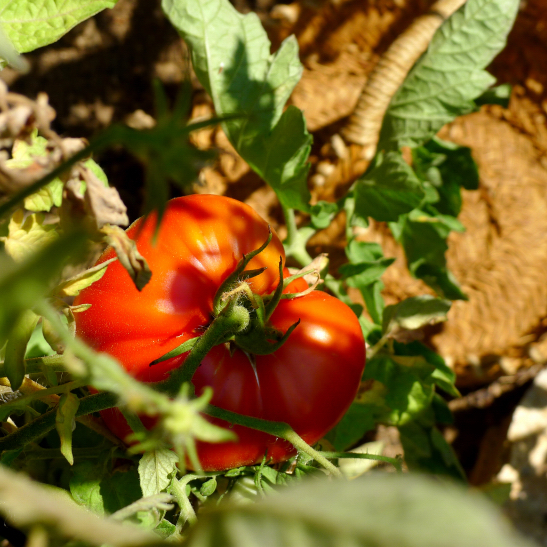 And, although southern Spain is a tomato paradise, in that the real-deal, vine-ripened tomatoes are everywhere, the “heritage” varieties, the super-good tomatoes, are not to be found in ordinary markets. I had to seek them out at the monthly organic farmers’ markets or from individual growers. 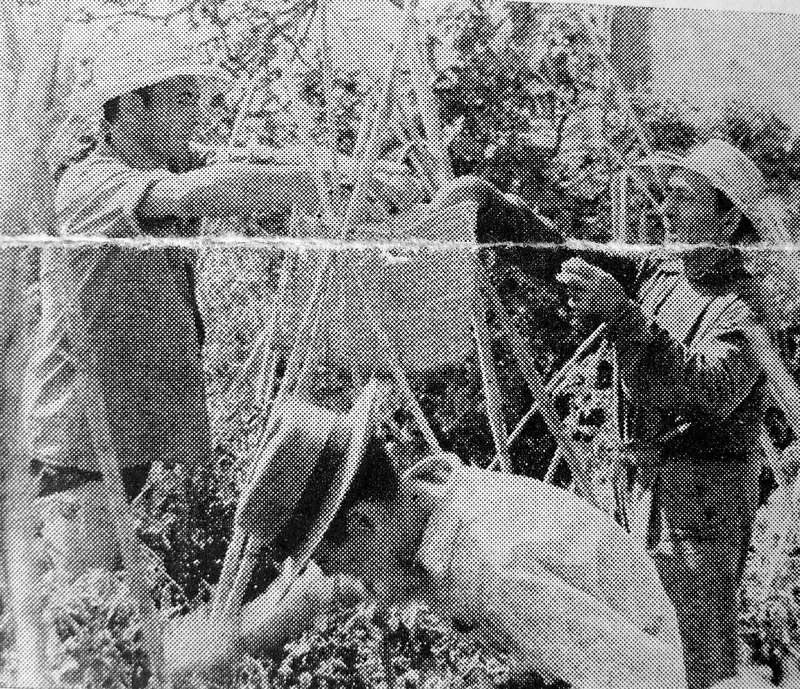 The best ones ever came from a guy named Ramón, a neighbor of a friend, whose has a river-bottom huerta near Tarifa. 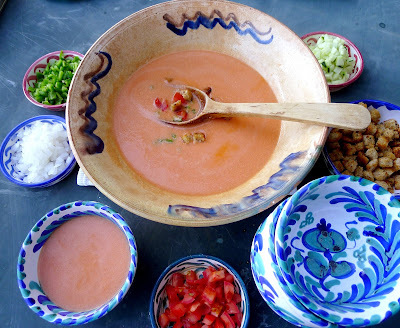 In the first week of THE GAZPACHO DIARIES, I gave you the basic gazpacho recipe. 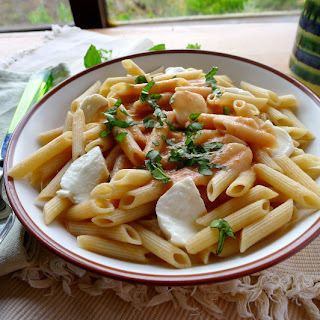 In Week 2, I explored the flavors of different ingredients, the tomatoes, olive oil, vinegar. Week 3 was devoted to gazpacho spin-offs and variations. Hey, gazpacho Bloody Mary is pretty good! Last week I took you back in time, to pre-blender days, for a traditional country gazpacho. Gazpacho is not always cold (see a recipe for hot gazpacho here). Sometimes it's not even gazpacho (see a recipe for cold melon soup here).It’s not always a soup, but can be a thick dip (see the salmorejo recipe) or a soupy salad (see pipirrana recipe). And, it’s not always red (see the recipe for gazpacho with no tomatoes--ajo blanco con uvas, white almond-garlic gazpacho). I’m beginning to harvest almonds, so tomorrow, instead of gazpacho, I’ll be making ajo blanco. I’ll serve it room temperature, rather than chilled. I've just picked some juicy grapes to put in it. 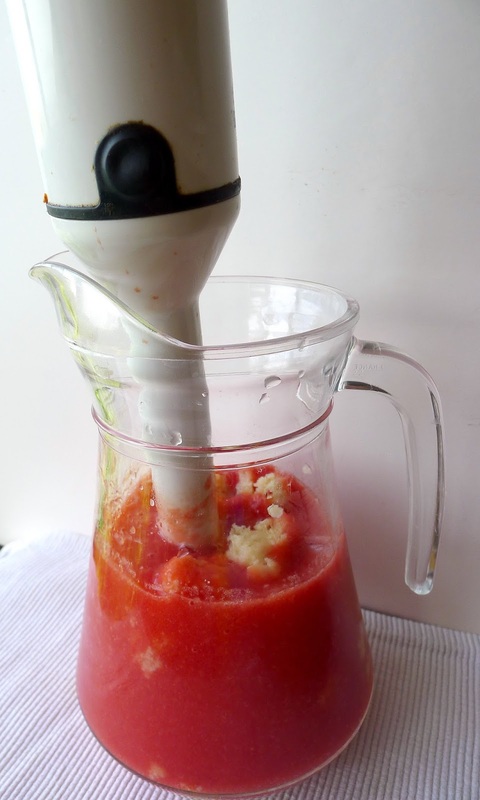 I learned to make gazpacho far from an electric blender. 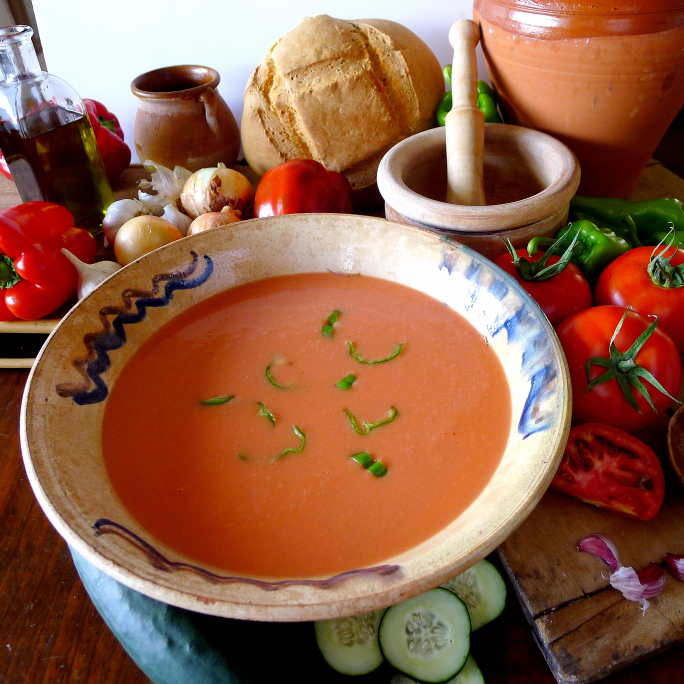 The first summer I lived in Spain, old man Vega showed me how to make real country gazpacho. Vega was the godfather of Paco and Estéban, the brothers who ran the village bar where I learned Spanish cooking. 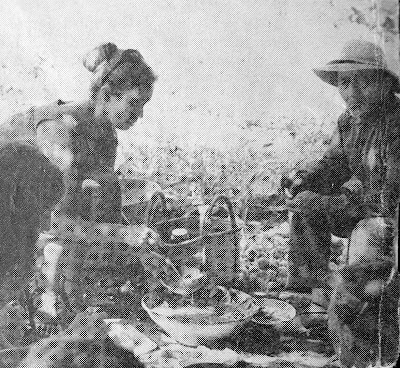 Vega had no family, but he did have a sizable plot of land in the campo (country). We arranged a day and got together a party. Our friend Irma, from Kentucky, contributed fried chicken and deviled eggs. Vega’s donkey was enlisted to carry Irma and supplies. 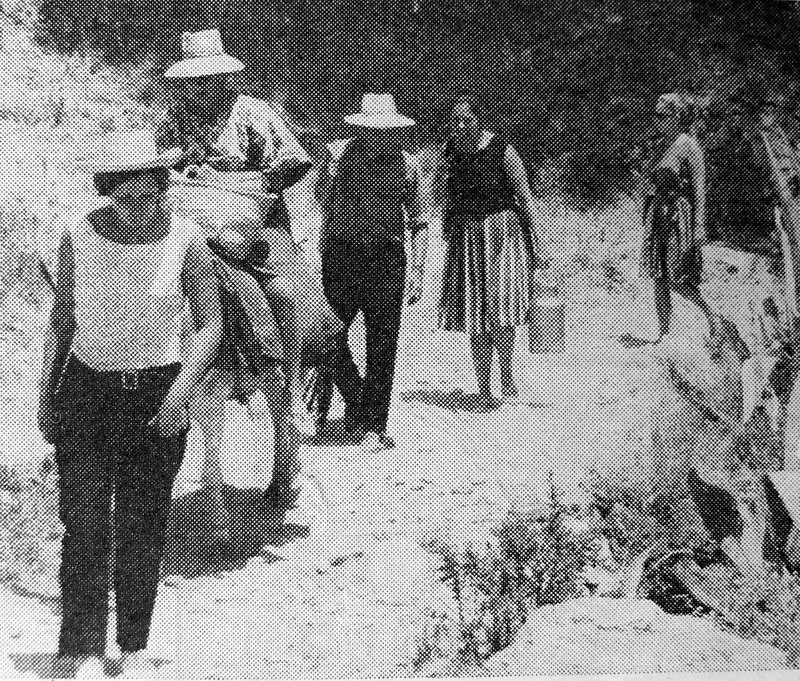 A case of beer, wine and soft drinks had been carried down to the finca, a small farm, in the early morning and were already cooling in the alberca, a spring-fed reservoir. Off to the campo on the camino real. We were quite a caravan on the dusty camino real, an ancient country thoroughfare traveled by people, donkeys and goats. It was a steep downhill trek. At the finca we cooled off in the chilly alberca and enjoyed a beer in the deep shade of a huge carob tree. Vega took a basket and went to pick tomatoes, peppers and cucumbers. Then he dipped them in the reservoir to rinse off the sun’s heat. 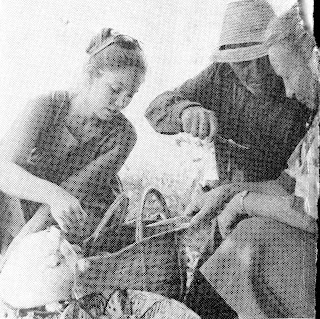 He set the basket at my feet, brought a giant earthenware bowl from the house with some onions and garlic. Picking tomatoes in the huerta (field). 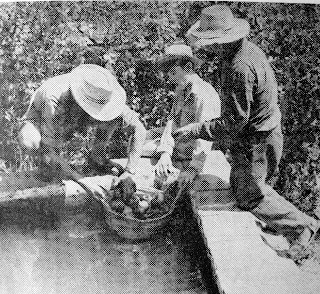 Washing the tomatoes in the irrigation reservoir. With a knife Vega proceeded to chunk a lot of bread into the bowl and moistened it with a little water. He crushed the garlic on a stone and added it to the bread. He cut up tomatoes into the bowl, mashing them as he went. Next came olive oil poured from a jug which was stored in a shed. We all helped dice up the cucumbers, peppers and some onion into the bowl. That's me, on the left, adding spring water to the gazpacho. Serving gazpacho where it grows. Garden tomatoes for country gazpacho. At long last, I have tomatoes, peppers and cukes from my own garden, so I am recreating that rustic, peasant gazpacho. These tomatoes—I think they are the esteemed variety, huevo de toro, similar to those called “beef heart,” only named for a different part of the bull’s anatomy—have tough skins that can be peeled off easily. I crushed 3 cloves of garlic in a wooden bowl using a wooden pestle. I soaked stale country bread (6-8 ounces) in water until softened, then squeezed it out and mashed it up with the garlic. I stirred in about ½ cup extra virgin olive oil, creating a thick paste. 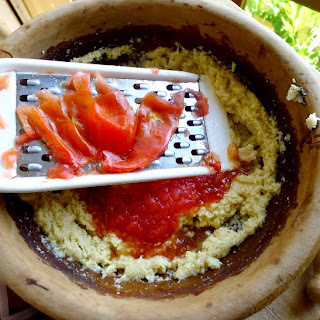 Chop or grate tomatoes into bread-oil mixture. I chopped the peeled tomatoes (about 2 pounds) and mashed them into the garlic-bread-olive oil paste in the bowl. If you don’t have tomatoes that are easily peeled, you could grate the tomatoes into the bowl, discarding the skins. Add chopped or grated tomato pulp. Add chopped peppers, onions and cucumbers. I added about 1 teaspoon of salt and 3 tablespoons of fresh lemon juice, ¼ cup each of finely diced cucumber, green pepper and onions and 1 cup very cold water. Thick, chunky country gazpacho, ready to serve. No fridge or blender required. The perfect meal on a hot August day in Andalusia. 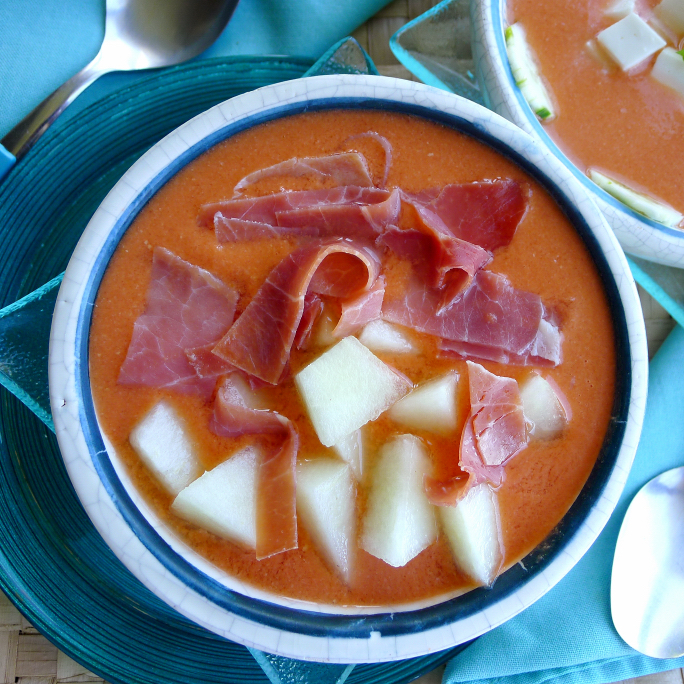 Serrano ham and sweet melon top gazpacho. Let the variations begin! If you’ve read the previous two entries about gazpacho, you might surmise that I am a stickler for tradition. Gazpacho is not just another name for “cold soup.” It’s a very particular Andalusian dish, almost a category by itself. “Liquid salad” is another way to think of gazpacho. It isn’t always made with tomatoes (there are authentic white and green gazpachos), but it definitely contains olive oil and, except for the bread, is, basically, all raw. 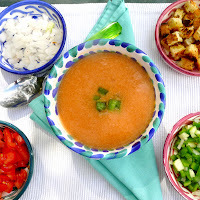 In a restaurant presentation, gazpacho typically comes accompanied by little bowls of chopped cucumbers, green peppers, onions, tomatoes and bread crumbs. Each person adds what he or she likes to the gazpacho. But other toppings are admissible! Chopped melon, apples, pears, grapes are all acceptable, the sweetness of the fruit contrasting with the bite of garlic and tang of vinegar. So, why not mango? Or raspberries? This week, I experimented with variations on the gazpacho theme. For almost all, I started with the basic gazpacho recipe (scroll down or check it out here) and just added different toppings and garnishes. I was amazed at how gazpacho served for many different meals and moods. Gazpacho with ham and melon, with fresh cheese and cucumber. 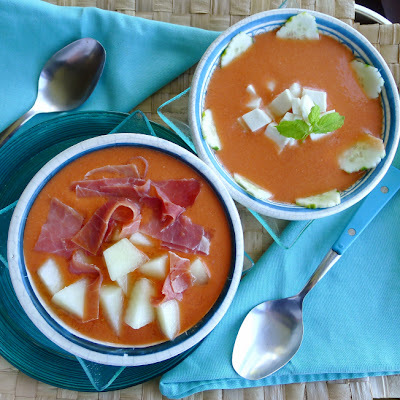 These two combos—gazpacho with ham and melon and with cheese, cucumber and mint—could be breakfast gazpacho or starters for a summer dinner. The ham is Spanish serrano ham. The white cheese is fresh goat cheese, cut in cubes. 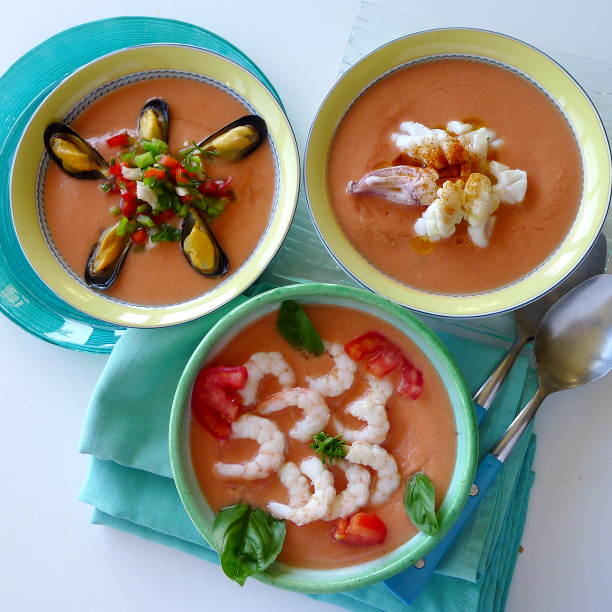 Gazpacho makes a tasty background for shellfish. These could be served as a light meal or as a starter. 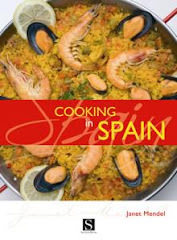 Cooked shrimp with sliced plum tomatoes; mussels with a chopped mixture of green and red peppers and scallions; and squid sprinkled with pimentón picante (smoked hot paprika). 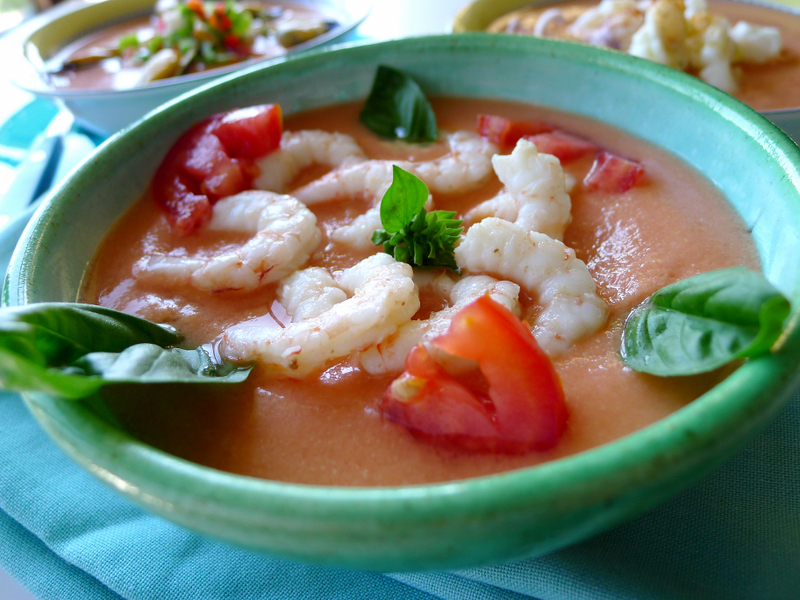 Gazpacho with shrimp, sliced tomato and basil. The shrimp are boiled briefly, plunged in ice water, then peeled and deveined. The mussels are steamed open, then dressed with olive oil. To prepare the squid, cut the body pouches open lengthwise and place flat on a cutting board, skin side down. With a sharp knife, score the squid in a crosshatch, without cutting all the way through. Cut the squid into 2-inch pieces. Drop them and the tentacles in boiling water for 30 seconds. Drain and refresh in cold water. Avocado and jalapeño add a Latin flavor. 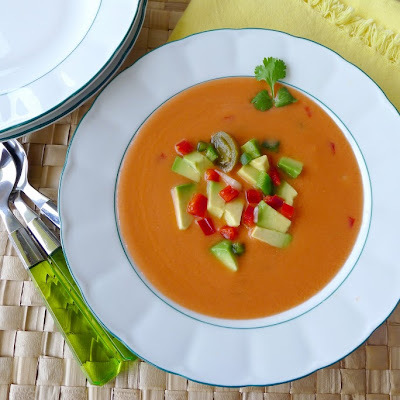 Topped with buttery chunks of avocado, chopped onion and red and green pepper for crunch, sliced jalapeño for heat and cilantro leaves for an earthy herbal touch, this gazpacho takes on a Latin flavor. 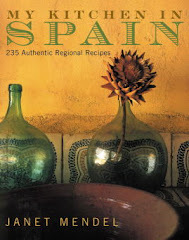 While chile would never appear in authentic Andalusian gazpacho, this is a permutation worth trying. I served it as a starter before charcoal-grilled pork chops. Gazpacho with no bread? Maybe you want it gluten-free or all raw or low in carbs. 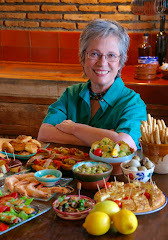 Martha Rose Shulman writing in the New York Times proposed a no-bread gazpacho recipe that is a basic gazpacho—minus the bread. 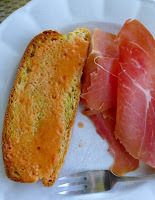 However, it is the bread-olive oil emulsion that gives gazpacho that wonderful creamy texture. Here’s a no-bread alternative. 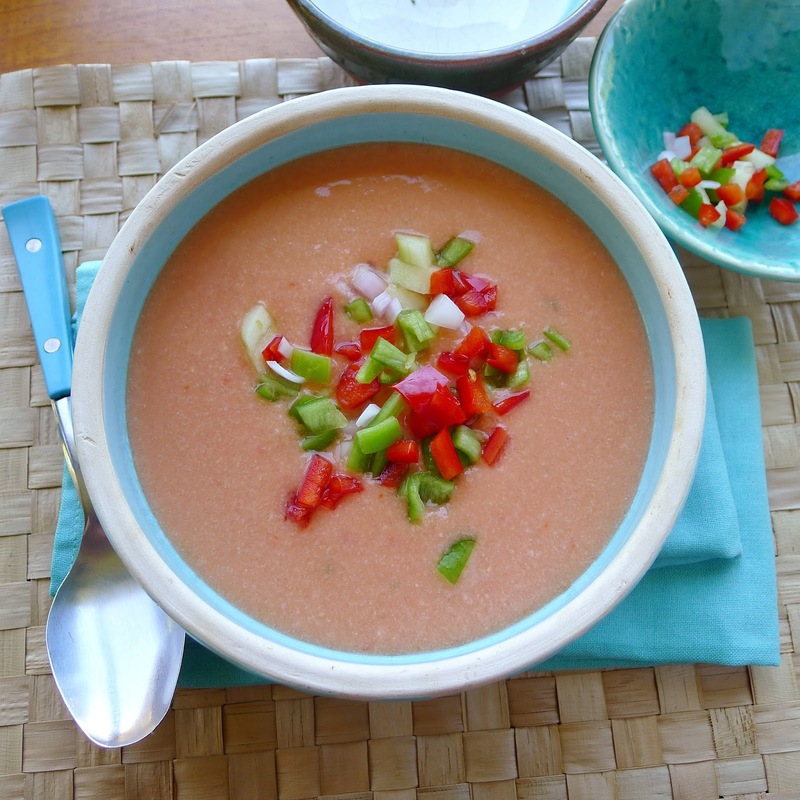 The egg-oil emulsion gives this gazpacho a silky texture (but, notice how it is pinkish in color rather than orangy-red as in gazpacho with bread). I used crunchy fried bread crumbs (or not! ), almonds and diced pear for contrast. I added no vinegar to this gazpacho, as the tomatoes without bread were tangy enough on their own. I used delicate Arbequina olive oil for this gazpacho. I used an immersion blender and put the ingredients in a bowl to make it easier to beat in the tomatoes. 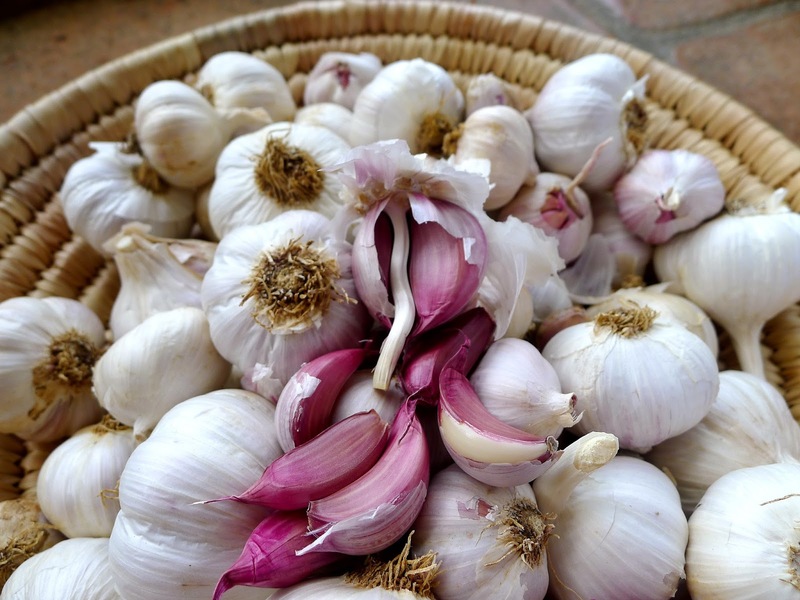 Place the egg and garlic in blender and whirl until garlic is chopped. With the blender running, add oil in a slow stream until the mixture thickens (may require up to ¾ cup of oil). Beat in the salt and slowly add 1 cup of the sieved tomatoes. Gradually beat in the remaining tomatoes. Chill the gazpacho. Serve the gazpacho garnished as desired. Bloody Mary with gazpacho and Sherry. “What about using gazpacho for a Bloody Mary?” OK, let’s try it! I used the basic gazpacho recipe, with bread, but without diluting with water. I substituted 2 tablespoons lemon juice for the vinegar. 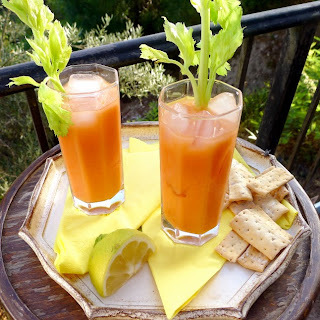 In tall glasses filled with ice, I mixed the gazpacho (4 fluid ounces) with dry fino Sherry (2 ounces) and stirred a dash of Tabasco into each glass. Very refreshing, revitalizing. I think I like this Bloody Mary—or is it a María Sangría?—for sundowners rather than brunch. We also tried it using Pale Cream from Montilla-Moriles, a slightly sweet fortified wine and liked that too. Have not tried it with vodka. 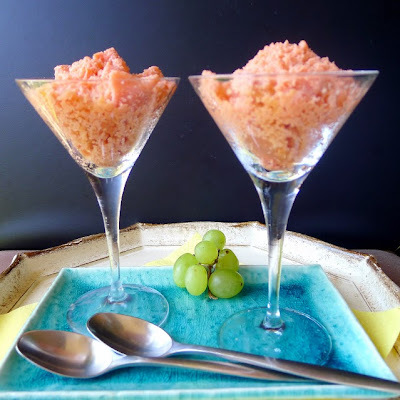 Icy gazpacho granizado (granita). Very refreshing! “Can I freeze leftover gazpacho?” a friend asked me. “I dunno, never tried it.” So I tried it. Except, instead of thawing and reconstituting the original gazpacho, I turned it into ice cream! Gazpacho sorbete or granizado (granita). I again started with the basic gazpacho recipe, with bread, adding 1 teaspoon sugar to the mix. Instead of vinegar, I used “sour grapes,” verjuice, unripe grapes, pureed with 2 pounds of tomatoes. I used only ¼ cup of extra virgin olive oil. I put the bowl of gazpacho in the freezer. When it was partially frozen, I used the immersion blender to whip it smooth, then let it freeze until solid. 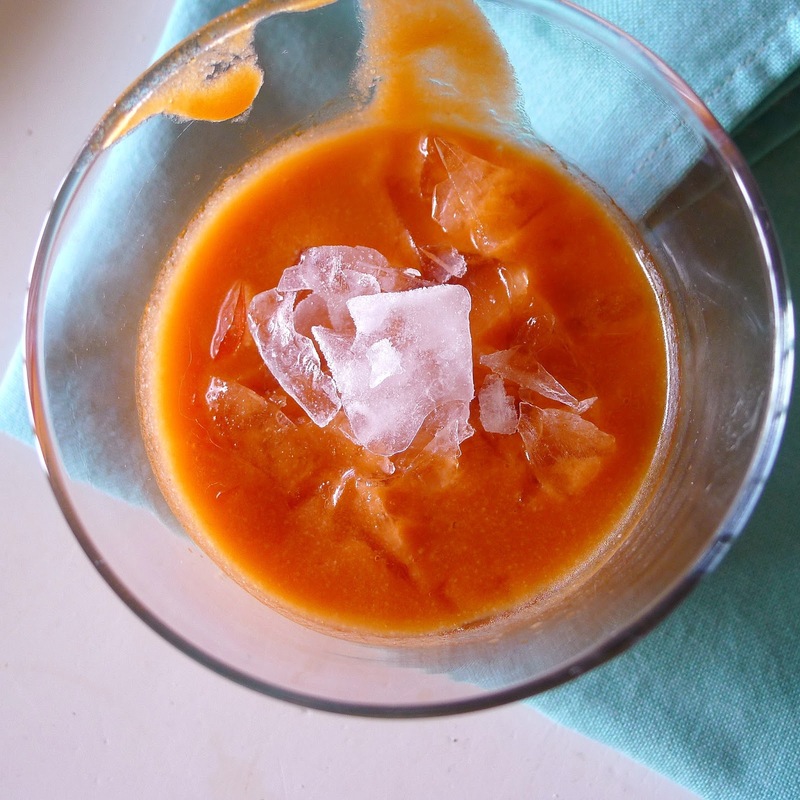 The frozen gazpacho needs to soften at room temperature for a few minutes. 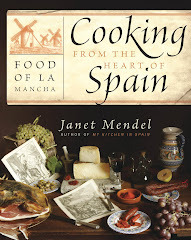 Then, use an ice cream scoop dipped in hot water to scoop it, or a fork to scrape it for granizado (Spanish for granita). Sliced black olives made a good topping. I bet black caviar would really pop on frozen gazpacho. Kernels of fresh corn? I bet I can spin off some more variations. 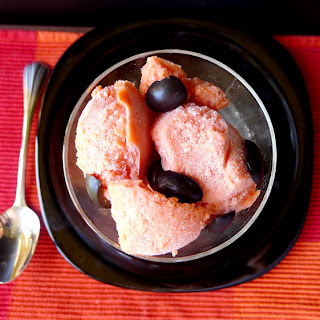 Gazpacho sorbet with black olives. 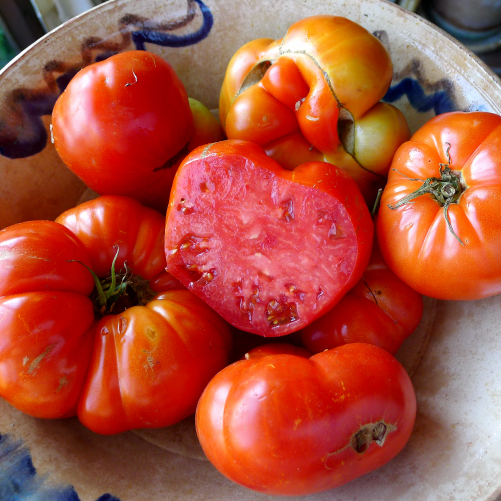 Ripe, juicy tomatoes, best for gazpacho. It's all about the ingredients! The first gazpacho I made this summer was not up to snuff. It was a hot, hot day, when a body craves the cool tang of a good gazpacho. But, it was desire unfulfilled. “The garlic tastes like plastic,” said Ben, my best critic. And so it did. Purchased at the supermarket, it was old and likely shipped from China, probably in plastic crates. 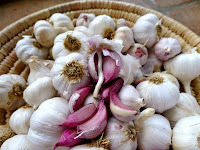 A week later I harvested my own garlic, fresh, juicy and pungent. “And, the tomatoes taste of nothing.” They were pretty tomatoes, big and deep red. But, Ben was right. They were too early, ripened under plastic to ship to northern markets. Now that we’ve got locally grown tomatoes, I bought several varieties of ripe, red ones to try in gazpacho—plum tomatoes (in Spanish they are tomates pera—pear tomatoes), big beefsteaks, pricey Raf tomatoes. 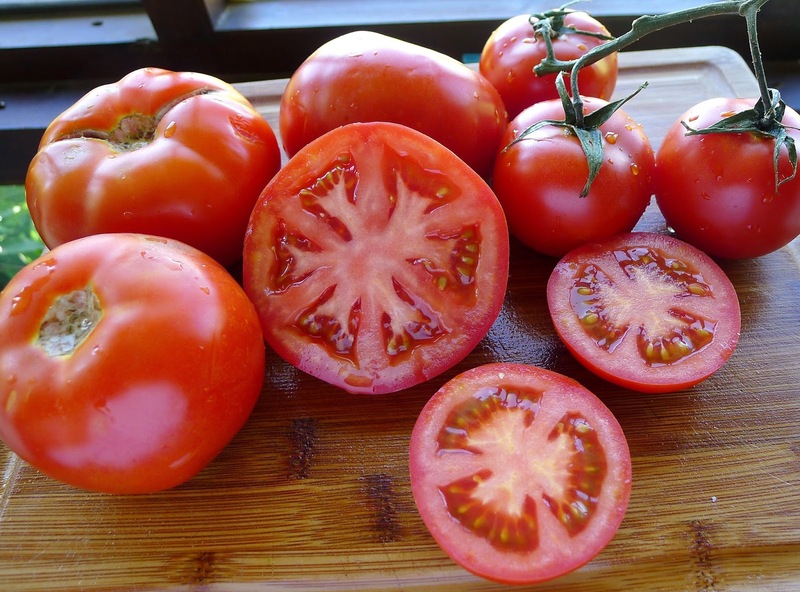 The big, mishapen beefsteak tomatoes, often with discoloration and blemishes, seemed to me to have the right combination of sugar and acid, sweetness and tang. They also had the best texture, but that was of less importance as they would be pureed for gazpacho. The Raf were equally delicious—but best to save for slicing. The plum tomatoes had nothing to offer in flavor, though they had fewer seeds than the other varieties. And the August version of the pretty ones I had used earlier in the season (variety Daniela, widely grown commercially) were as dull as they were before. They are as if stamped from a mold. 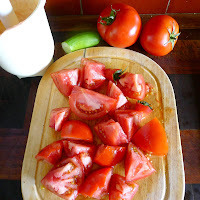 Since then, I have been experimenting with each of the ingredients in basic gazpacho (scroll down to last week’s blog to see the basic recipe). Country bread is best for gazpacho. Bread. Sturdy country bread made from pale unbleached flour and baked in an horno de leña (wood-fired oven) really is best. 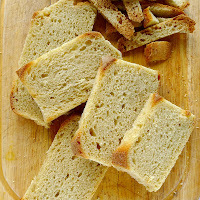 But, I absolutely would also use any leftover baguette or roll, once it was one or two days old. 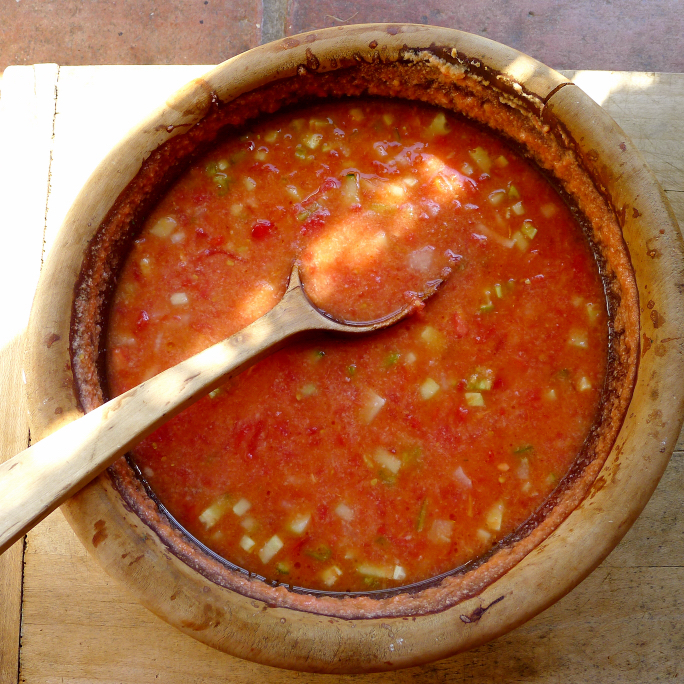 In the traditional kitchen, gazpacho was a way to use up stale bread. Soaked in water until softened, the bread is squeezed out and beaten with the olive oil to make a smooth emulsion. Do you really have to remove the crusts (as I specify in the recipe)? No. Crustless bread makes a more refined gazpacho, but, so what? And, yes, you can substitute good whole wheat bread. 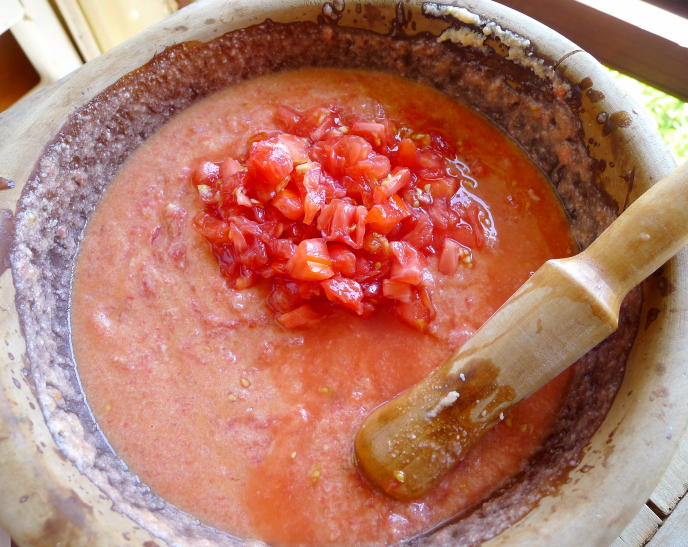 What you shouldn’t use in gazpacho is packaged bread with preservatives and added sugar. Vary the gazpacho with single varietal olive oils. Olive oil. It has to be extra virgin. My everyday oil is an extra virgin with a supermarket label (my own olive oil was used up months ago). Like most olive oil from Spain, it is a blend of olive varieties. Either different varieties of olives are all milled together or, with higher quality oil, the olives are milled separately, then a coupage is blended to achieve a balance of flavors. For the gazpacho experiments, I added different single oil varietals to the same batch of gazpacho. I used Picual, Hojiblanca, Arbequina and Vidueña (which I had never tried before). Picual and Hojiblanca—the most widely grown olives in Andalusia—were very similar (perhaps because they were made by the same cooperative)—pleasantly fruity. The gazpacho with Arbequina oil had a distinctly sweet almond taste while the Vidueña had a bitter edge, not unpleasant with the sweet tomatoes. Some other time I might try out flavored olive oils—smoked, herb, citric—to give gazpacho another dimension. Vinegars, from the left, red wine, white wine, PX and Sherry. Plus, unripe grapes and lemon juice. Vinegar. I also tried out different vinegars as well as lemon juice in another batch of gazpacho. They were white wine vinegar, red wine vinegar, Sherry vinegar, Pedro Ximenez Sherry vinegar, lemon juice and verjuice (made from unripe grapes). 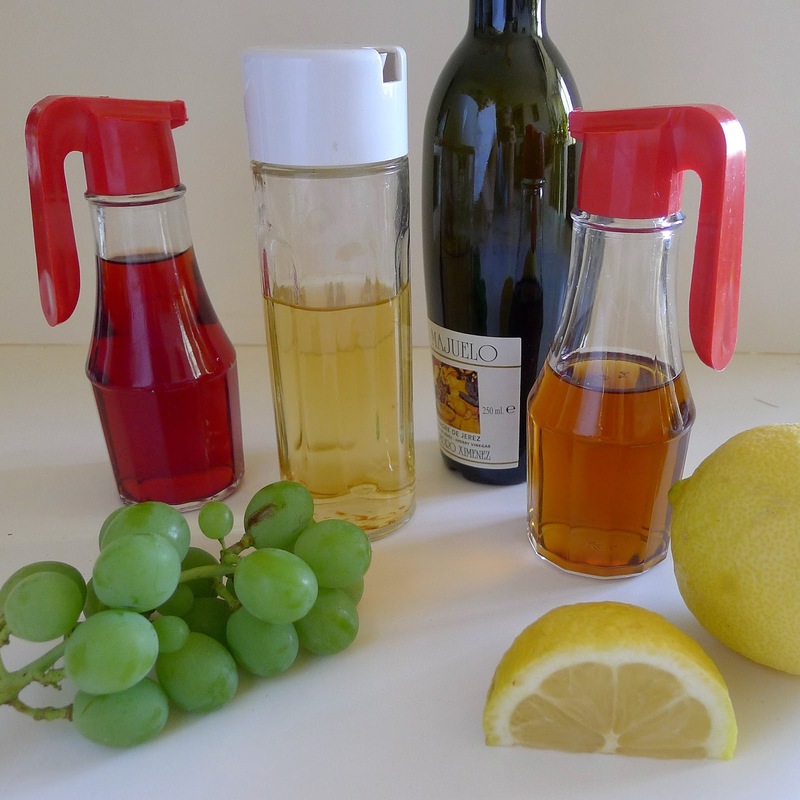 White wine and red wine vinegar have 6 percent acidity while Sherry vinegar has 7 percent. So, I added less Sherry vinegar to 1 cup of gazpacho. The lemon juice was much less acidic, so the gazpacho needed propotionately more. Plain white wine vinegar—the most widely used in Spain—was just fine. Fruity and tangy. The Sherry vinegar we liked best for depth of flavor, mellowness as well as acidity. The PX vinegar had a distinctive raisiny-winy taste—not quite compatible with gazpacho. Lemon’s citric acid gave a completely different tang, delicious in a different way. The homemade verjuice was not very satisfactory, maybe not enough of it. Peppers, cucumbers, onion. These are all nonessential ingredients, so did not merit extensive trials. The green peppers most used for gazpacho in Andalusia are the skinny, green Italian frying peppers. Their bittersweet flavor and crisp texture are just right as a chopped addition. 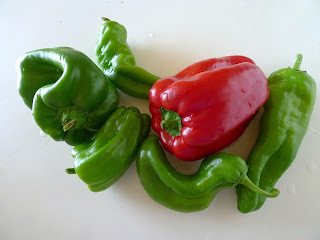 While red bell pepper is hardly used at all, I must say, it sure looks pretty in a picture! Salt. It never occurred to me until this minute to try different salts in gazpacho. Next batch. Water. Cold spring water is best, but not easily come by. I use well water. Rather than chlorinated tap water, use bottled water to dilute the gazpacho. For an interesting variation, try fizzy soda water. Add it immediately before serving, so it doesn’t lose its bubbles. Which gazpacho is best? Today's gazpacho! Andalusian gazpacho with all the trimmings. Gazpacho refreshes on a hot day. “OK,” I said. “Every day for a month, gazpacho always on tap.” The essential survival method for an Andalusian summer. I’m starting with traditional gazpacho, but then I’m also going to experiment with some variations on the theme. I want to test subtle differences in ingredients—olive oil varietals, different vinegars, types of tomatoes. I’m going to serve gazpacho for lunch, as a pick-me-up on a sweltering afternoon, for beach picnics, for tapas, as a starter for a dinner party. The first gazpacho occasion arrived with a visit from New Yorkers, Carrie and Marc Bachman. 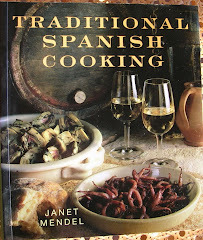 Carrie was my publicist at HarperCollins, setting up book tours and media interviews when my cookbooks came out (MY KITCHEN IN SPAIN in 2002 and COOKING FROM THE HEART OF SPAIN in 2006). She’s now a culinary public relations freelancer (http://www.carriebachman.com) , handling such well-known authors as Mario Batali, Emeril Lagasse, Ina Garten and Nathan Myhrvold. 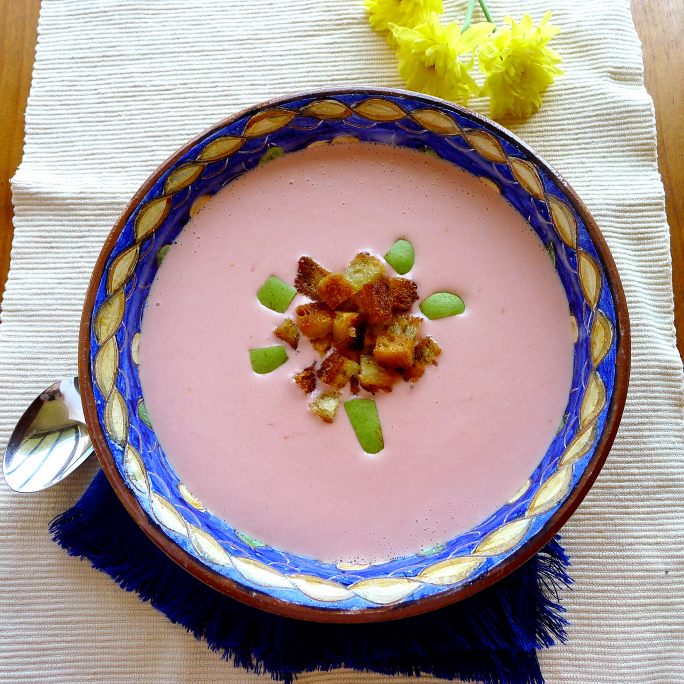 “When we first tasted gazpacho in Seville, we thought it had cream in it,” Carrie said. She joined me in the kitchen to make gazpacho. 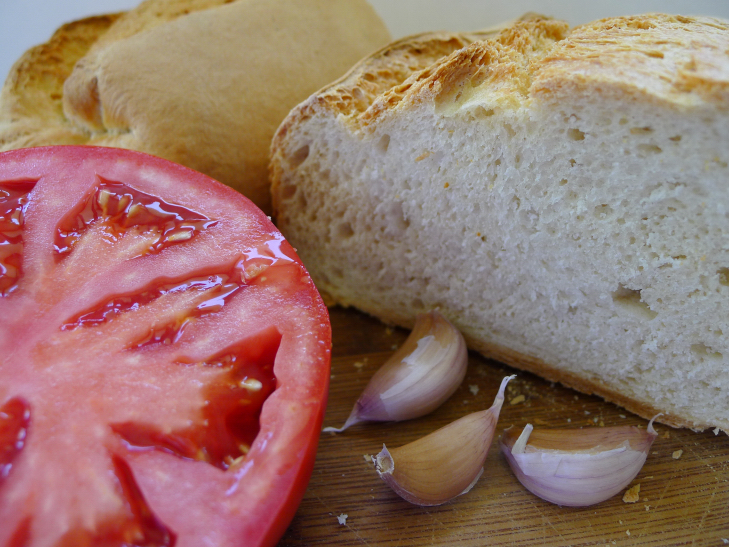 I used a blender to make a smooth emulsion of bread, garlic and olive oil, then beat in the fresh tomato pulp. It’s that bread-olive oil emulsion that makes gazpacho so creamy. I served gazpacho on the terrace at sunset with all the garnishes—chopped onion, peppers, cucumbers, tomatoes and bread crumbs. Marc opened a bottle of chilled rosado (rosé). I passed a plate of tuna-stuffed eggs to fill out our light summer meal. Making gazpacho takes only minutes. Whirl the bread, garlic and olive oil in a blender, beat in the tomato. Diluted with cold water, the gazpacho can be served immediately. 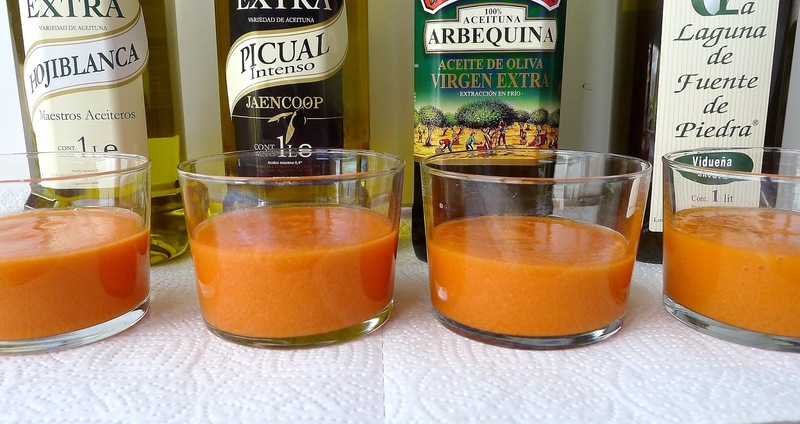 Extra virgin olive oil is absolutely essential to make gazpacho. Otherwise, it’s not gazpacho. Bread is pretty basic, though I’m willing to entertain all-raw, gluten-free versions without bread. Salt, garlic, vinegar or lemon juice. While not all gazpachos are red, for this cycle, we’re counting tomatoes as essential. Green pepper, cucumber, onion, ground cumin, pimentón (paprika). No tomato juice. No canned tomatoes. No tomatoes dropped in boiling water to facilitate peeling them. No ketchup. No chicken stock or beef stock. No pepper or chile. No salsa. No beets or watermelon or strawberries. I once had a fierce argument with a dinner companion about whether or not to sieve gazpacho. She swore that never, ever was it sieved. 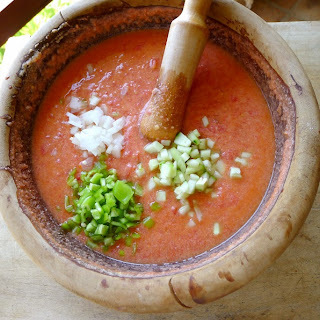 It’s true that, in its most rustic version, made in the fields, gazpacho isn’t sieved. However, most blender-made gazpacho is better if sieved. My own method is to puree the fresh, raw tomatoes (and peppers and cukes, too, if using), then pass them through a chino, a conical sieve. That step removes all the seeds and skins. Only the tomato juice and pulp go into the gazpacho. The tomatoes can be prepared in advance of making the gazpacho. The bread-oil emulsion thickens the gazpacho, so it needs to be thinned with water. How much? I like gazpacho the consistency of light cream. You can drink it from a glass or spoon it up like soup. Be sure to taste after thinning and add more salt and vinegar if needed. Cracked ice for a quick chill. To chill or not to chill. 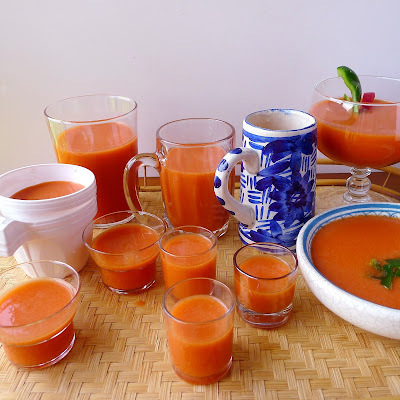 At its best, gazpacho is diluted with very cold water and served immediately. That’s because refrigeration damps down the sweet-tangy flavor of fresh tomatoes. Nevertheless, it is so refreshing and restorative when served icy-cold. So I almost always make gazpacho early in the day and chill it well. Not acceptable are ice cubes which cause the oil to congeal. However, cracked ice will do in a pinch. A pitcher for easy serving. A big earthenware bowl or tureen makes a beautiful presentation at table. 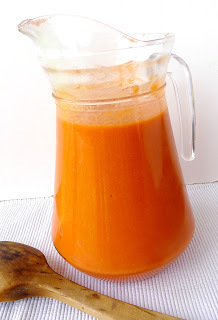 But, the easiest way to serve gazpacho is poured from a pitcher. Use a pitcher with a lid and you can store it in the fridge. Serve gazpacho in tall glasses, goblets, mugs or short glasses for sipping (or swigging). Serve it in soup bowls with spoons. At a tapa party, put gazpacho in shot glasses for “shooters.” Plastic cups for beach picnics. Serve gazpacho in bowls, glasses, mugs. This is a starting point. I rarely follow my own recipe. Sometimes my gazpacho is thicker or thinner, more creamy (more oil), tangier. Ben says I don’t use enough salt. He also doesn’t like the addition of cumin. But, once you tune-in to the gazpacho mystique, you can alter it to suit your tastes. Day-old bread to thicken gazpacho. 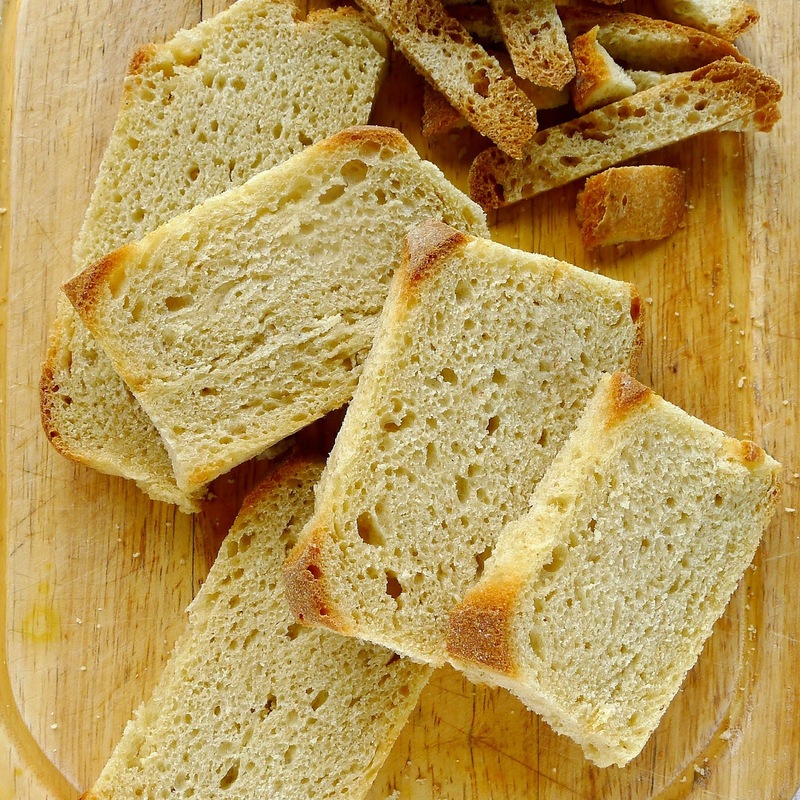 Break the bread into chunks and soak it in water to cover until softened. Remove cores from the tomatoes. Cut them into chunks and puree in a blender or food processor. 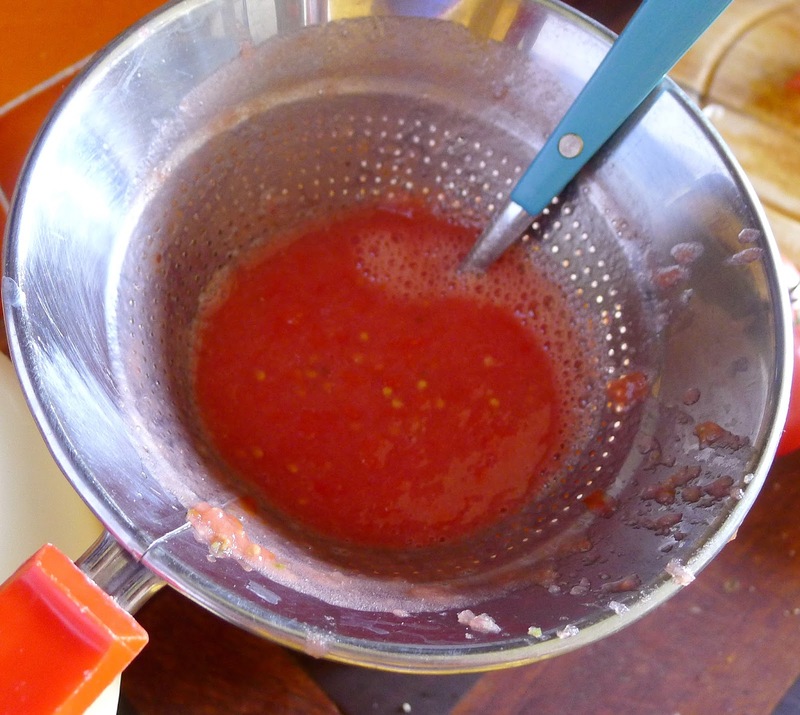 Press the juice and pulp through a sieve, discarding the bits of skin and seeds. Add the tomato pulp, green pepper, cumin and salt. With the blender running, add the oil in a slow stream. Notice how the mixture changes color, from pinky-red of tomatoes to creamy-orange after addition of oil. Blend in the vinegar and some of the water. Place the gazpacho in a pitcher and add remaining water. Serve immediately or chill until serving time. 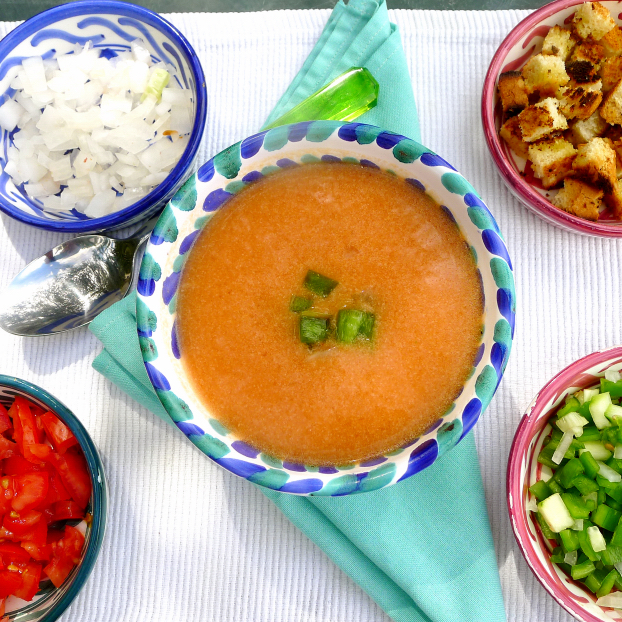 To serve: pour the gazpacho into individual bowls. Place each of the garnishes in small bowls. Pass the garnishes with the gazpacho and allow guests to serve themselves. Serve gazpacho with chopped vegetables to garnish.